Have you every wondered “Why is my Mac running so slow, I haven’t opened anything yet?” Well did you know many software makers have a sense of humor, and when you install their software, it adds a function where the software starts in the background when your Mac starts. If it’s in the background you most likely won’t know its running, but it is and it’s taking up resources. The more programs installed the more things in the background. So how do you know what is set to automatically start, and how do you Speed Up Your Macbook? With a Mac, its known as Login Items, and in this article we will discuss how you can check and change your settings to Speed Up Your MacBook – Check Login Items. 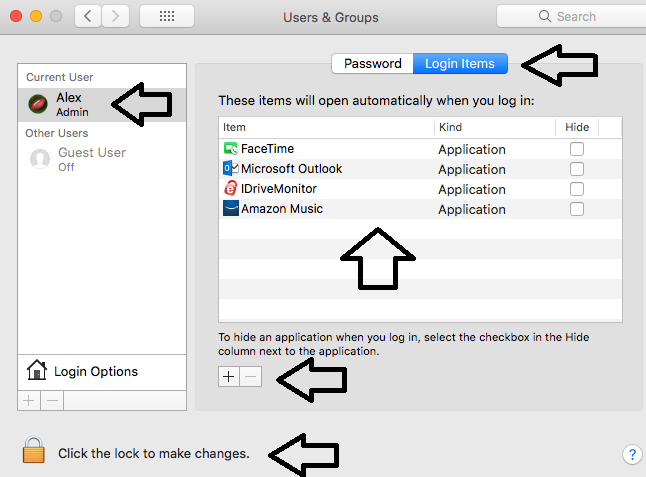 In Users & Groups -> Select the Current User , if you log in to your Mac with a password, you may need to click on Click The Lock To Make Changes in the bottom left corner of the window, and enter your login user name / password. Once the lock setting shows open, click on Login Items. In this window you will see everything that is scheduled to start each time you boot the Mac. Anything that you don’t need to run automatically (ie – Games, Music, Facetime, etc), highlight that program and then select the – (minus sign) to remove the program from the list. If you find that you need to add something to autostart, all you need to do is select the + (plus sign) and then select the application from the list that opens. By removing the items from this list, you are NOT deleting anything. All you are doing is removing them from auto start. The programs removed from this list will start, if and when you click on them to start.